I have blogged quite a few times on the issue of empty homes/properties in Porthleven. The whole subject of trying to bring these types of properties back into use is a difficult and emotive subject. It is also a long process, sometimes because of legal proceedings, or the owner unwilling to do anything. The good news is one of the long-standing empty properties should I hope, have something done about it in the very near future. The property in question is Lyndhurst and the Old Dairy on Thomas Street. The whole issue surrounding the property is a very personal, and I have a lot of sympathy to the owners and their situation. However, the owners now have decided to auction the property and put the whole issue being them. This is good news because I and the Empty Homes team at Cornwall Council has worked with the owners to solve this difficult situation. I am glad everyone involved has come together to work on this. I will look forward to either the site being put back into use; either by using the existing structure or, if the plans are right for the site, a new building. When talking about housing and Cornwall in the same sentence you often get the same replies. Too many second homes and not enough affordable housing. Both of these issues do have an affect on the housing stock in Cornwall, but there is another category that is hardly mentioned. And that is empty homes. Empty home’s is a problem for Cornwall’s housing stock and as of 1st July 2012, there are currently 3875 properties registered as long-term empty in Cornwall. Now granted it is not always the fault of the owner as why a house is empty because many are subject to legal proceedings like probate, repossession, divorce etc. Besides the properties that are known to the Authority via the Council Tax register, the Empty Homes Team is in correspondence with the owners of 487 properties that are not registered as long-term empty, but are not in use. However, there are many whose owners just does not care if their property is left empty. It is these that should be targeted to see what can be done to bring them back into use. Cornwall Council’s Empty Homes Team has had some success in bring these empty homes back into use. In the last quarter of 2010, 89 homes were brought back into use. For 2012, a 142 and for the first quarter of 2012, 46. This is good news, but is only scratching the surface of the problem. More could be done, but this relies on more money being assigned to the issue. Central Government has awarded several million to help Cornwall Council, but this is like taking a bucket of water out of the sea. In Porthleven, my last figures had 27 properties that are classed as empty homes. I have been working with the Empty Homes Team to highlight those have been long-term empty. The owners of these properties have been contacted, and some progress has been made. However if the owners still do not respond, Cornwall Council can use its powers of Compulsory Purchase. This though can be a long and expensive process, and has yet not used these powers. Let’s hope by talking to the owners of the properties, a lot can be brought back into use. There could be various reasons like a divorce, probate issue, or some other legal reason which does not allow someone to live in this house. The house could also be in the process of being renovated. There is also the owners who are not bothered if anyone lives in there. Unlike second homes who can have a 10% discount on council tax, or a holiday let which is subject to NDR, a empty house will pay full council tax after a period of six months of having it free. I believe the free period take into account the previous points on why it could be empty. After six months it is reasonable to think any issue has been sorted. In theory you could claim it is empty for six months and then turn it into a second home after that. I wonder how often this happens, and the amount of council tax lost. So the question is how many homes in Porthleven fall into the this category of empty homes? The answer is 27. Two of these are being dealt with as a priority by the Cornwall Council’s empty homes team after I highlighted the long term problem surrounding these buildings. As for the rest, the empty homes team is looking into them. As I have used Looe and Padstow as comparable places to Porthleven here are their numbers. Cornwall Council is doing something about this by trying to bring back into use these empty houses. Money has also been budgeted to the tune of £1.8 million and the council has just been awarded a further £3.8m from central government to help with this problem. This fund might sound a lot, and it is a start, but there is still a long way to go if the council wants to solve this issue. I have blogged about this subject before HERE and HERE. To (mis)use the phrase said by James Lovell: “Cornwall, we have a problem” pretty well sums up the situation. I first found out about this today, when a statement was released by Cornwall Council. Not sure what to make of it, but I thought it would be of interest to my readers and followers. I guess we will have to wait and see how well this turns out and the level of take up. Below is the statement and information released by Cornwall Council. Cornwall Council is offering a variety of affordable loans to those on low incomes to help them repair and improve their homes. Cornwall Council was successful in a bid for government funding to set up and offer interest free loans (subject to availability and eligibility) to low income households to help them carry out essential repairs and basic improvements to their homes. The purpose behind the loan scheme is that all loan repayments will be recycled to help build a self sufficient, recycled source of home improvement funding for future necessary lending that becomes less and less reliant on public funding. Healthy Homes loans are interest free and available to low-income householders of any age for essential repairs and some energy efficiency improvements. First-time buyer’s loans are interest free to help local people buying a property that has been empty for longer than 6 months, to carry out essential repairs and improvements to return the dwelling to use. Landlord Assistances includes 50% loans are available to private landlords to help them carry out essential repairs, fire safety precautions; improve security measures and energy efficiency. Landlord assistance also includes loans towards conversions of larger houses into family units or flat let’s to address a particular local housing need. We can also offer financial assistance in bringing empty properties back into use for private rental. This scheme in particular will result in good quality affordable long term accommodation being made available as, in return for the loan, the owner must let the property at Local Housing Allowance (LHA) rates for a period of 5 years to tenants nominated by the Council. The nomination rights are used for people that the Council are likely to accept as statutory homeless; who are unable to financially secure accommodation themselves; or to prevent homelessness and the possibly of being placed in temporary accommodation. It also allows the team at the Council to build good working relationships with much-needed, responsible, landlords. House-proud loans are available to the over 60s (or households with a disabled person) who are in receipt of a means tested benefit, for repairs, improvements and adaptations. Interest rates apply. Home Health Energy Efficiency Grants are available to help install loft insulation, cavity wall insulation, and other energy efficiency measures. Grants are available to help disabled people with adaptations required to their homes and government funding is available for Warm Front heating grants. Free advice and information is available to all householders on how to improve and maintain their homes. In Cornwall there is alleged some 4000 homes that have been unoccupied for over 6 months. 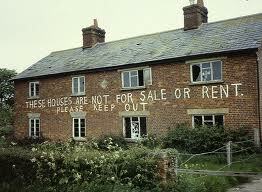 That in anyones book is a lot of homes that could be brought back into use. Cornwall Council recognises that this problem should be addressed. The trick is how? In simple terms, and I believe a valid argument is why build more homes when there are many unused. Cornwall Council as the Local Authority has some pretty far reaching powers to address this. The end of the scale is Compulsory Purchasing. It does not like to use this lightly, but there is a feeling that these powers should be exercised to solve this problem. In a recent survey that Cornwall Council undertook to help build a database on empty properties and to make sure that the data held on them was correct. This survey threw up some interesting figures which I will list below. 3597 empty properties that have been empty for at least six months. Now the first two bullet points are harder to address without a change in the law. Something that has not been fully addressed in the lofty towers of Westminster (and will it ever be??). The last bullet point is easier to address and is now being pursued by Cornwall Council. How? Well, Cornwall Council has made available a pot of money of around £1.5 million. This of course could not buy up all these properties because the average price of a 3 bed property is around the £180k-£200k mark. The way they are going to tackle it is to encourage those owners to bring them back into use for the population. This could be done by loans to bring the building back to a habitual standard, advice on renting it out or others means of helping those owners. If that fails, then I do feel that Cornwall Council will flex its might and head to the courts. Now if anyone does know of empty properties in their areas, then contact Cornwall Council, or their local Cornwall Councillor. Failing that, drop me a e-mail and I will make sure the property is investigated. I have been asked by Cornwall Council to survey Porthleven for empty homes that have not been in use for over 6 months. I am not sure how many we have, but there has not been a survey along these lines in a long time. Very often empty properties are owned by people who are elderly, disabled or simply do not have the funds to bring the property back into use. Cornwall Council has adopted a Housing Renewals Policy that offers financial assistance to empty property owners.